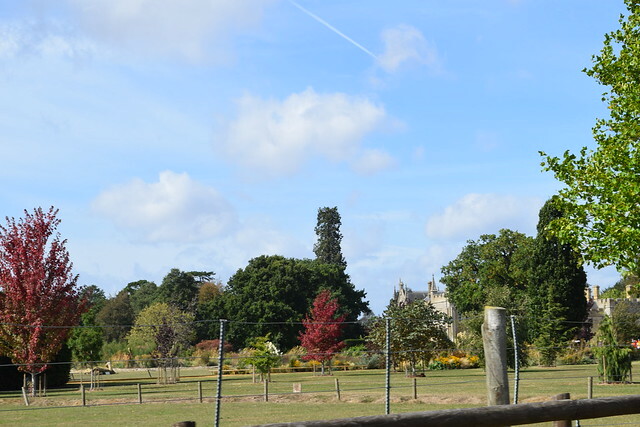 It was a beautiful sunny late September day when we went to the wildlife park. We started with the walled garden complete with penguin and lemur enclosure. The garden is small but spectacular and still very much in bloom. They had a few angles trumpets we also have at home. You walk around the lemur enclosure and stand just a couple of feet away from the penguins. This is close to the entrance and you have a shop with the usual sorts of gifts and a small windows where you can order a hot dog and a coffee. Further into the park where the main house is situated, you can find a much larger restaurant. The food is simple and when we visited had been under hot lamps for a while so was not particularly appetising but this is normally the case I find with these sorts of places. Entry to the park is £16 and you can take dogs into the park although not everywhere. I recommend taking the little train that goes around the park as it gives you a good idea of what there is too see and where it can be found. You cannot drive through the park but its small enough to see everything in half a day. I think my favourite part was the tropical greenhouse where there are a variety of birds, sloths, rat-like creatures running around your feet. It reminded me a little of Kew Gardens and the Eden Project.